Releasing amidst all lot of hullabaloos, it was interesting to see how ‘Ramaleela’ performs. 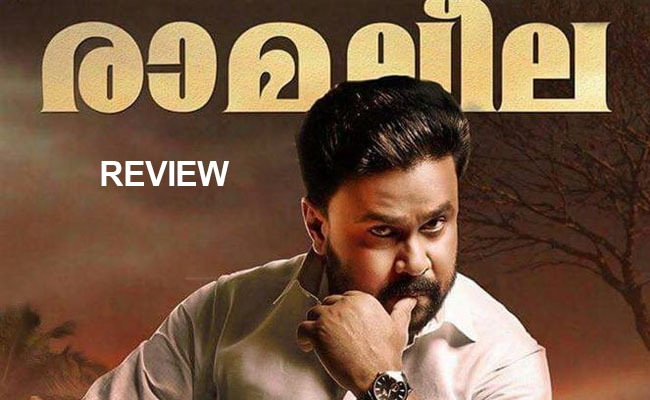 Well, shaking all previous memories of comic entertainers from Dileep, this movie has turned out to be a decent thriller, with a definite politics attached behind it. What makes ‘Ramaleela’ an interesting film is that, debutant director Arun Gopy has underlined one thing that he is definitely a man to look for in future. Set in line with the two popular political ideologies which Malayalees keep close to heart, ‘Ramaleela’ has Ramanunni (Dileep) – indeed an MLA – breaking away with his party DCP, over an issue dear to him: he is all set to go for an election under a new tagline. Well, he was forced to face off with an unexpected opponent from DCP – his own mother. Soon then we see Ramanunni coming across some tough times in his life, when he got arrested over murder charges. It is his journey in proving his innocence, which forms the crux of ‘Ramaleela’. As we said initially, what makes ‘Ramaleela’ apart from other Dileep movies is that it has got a strong content in it. Scripted by Sachi, the movie has got a good storyline on its back – something which helped Arun Gopy wielding out the project without many mistakes. Belonging to the political thriller genre, ‘Ramaleela’, though follows the pattern of the similar movies chalked out in Malayalam cinema before, however has ensured that no loose ends were left at the end. Having said that the movie began on a promising note, the post interval sessions appeared too bleak indeed. Nonetheless, the team gained momentum towards the end portions, when we have a decent ending. While watching ‘Ramaleela’, the memories of many movies beckoned, for instance ‘Run Baby Run’ – which was penned by the writer himself. But, such similarities can’t be termed as serious issues while judging the cinematic experience, which ‘Ramaleela’ provided. Speaking about the performance, it was refreshing seeing Dileep in a serious role after a while. It was a packed performance from Dileep, who excelled in the role of a convict, who tackles all adversities in proving his innocence. Radhika Sarath, essaying the mother character to Dileep, has done a fantastic job and made her comeback to Malayalam cinema in style. The movie boasts a long list of proven stars in it. For instance, it was a treat watching Kalabhavan Shajon, who was successful in pulling off both sentimental scenes as well as comic instances. The same applies to Mukesh, Siddhique, Prayaga Martin – though nothing much was there in for her – and to name the rest. Technically speaking too, the movie hasn’t had any serious flaws. Though this film is a bit lengthy by today’s movie watching culture, it only had three songs – which were in tandem with the mood, so was the BGM; good work form Gopi Sunder. Shaji Kumar while heading the cinematographic department and the editing by Vivek Harshan too kept the momentum right for ‘Ramaleela’.